In this week's video, I'd like to take you on a bit of a visual tour of history. 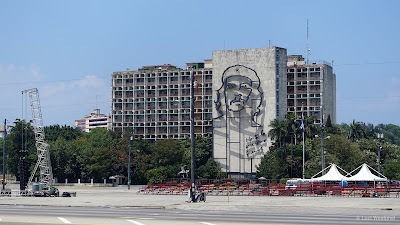 We start at the Hotel Nacional de Cuba (built in 1930), drive a Cuban classic car taxi past a mural depicting the travel of the Granma yacht (that brought the revolutionaries, including the Castro brothers, Guevara and Cienfuegos, to Cuba in 1956 to overthrow the Batista regime) and end at the Plaza de la Revolución, completed in 1959, the year Fidel Castro came to power. The Hotel Nacional de Cuba was very popular among the international rich and famous from the 1930s to the 1950s. Today, it has a fascinating mix of its old glamour on the outside, but (supposedly) stripped down soviet-style hospitality on the inside. All I can say is that sitting on the breezy terrace after walking the Malecón all the way from Habana Vieja and drinking the most refreshing daiquiri was one of the most luxurious experiences we had in Cuba. I should also mention that the famous hotel band Trio Los Titanes played a song for us. Usually, I can't stand musicians playing at my table. But right then and there, it was just perfect. I recorded their performance in hopes of using it in this video. But the noise of hammering in the background was too distracting in the video (although not very noticeable at the time). At the Hotel Nacional, you have an amazing view of the Malecón all the way to the Castillo del Morro Castle and Lighthouse. You can also get a glimpse at trenches and bunker entrances built during the 1962 Missile Crisis. The Plaza de la Revolución is the large Havana square where all the big parades and events take place. It features the José Martí Memorial: a 109 m (358 ft) tower and a statue of Martí, a Cuban hero who lived in the mid to late 1800s. Unfortunately, we were not able to enter the tower (though you're supposed to have an amazing view from up there). Famous are also the buildings for the Ministries of the Interior and Communications because of the two big steel faces on their facades. One shows Che Guevara, with the quotation "Hasta la Victoria Siempre" (Until the Everlasting Victory, Always); the other shows Camilo Cienfuegos, with the quotation "Vas bien, Fidel" (You're doing fine, Fidel). The song featured in this video is “Carnivale Intrigue” by Kevin MacLeod (incompetech.com). It is licensed under Creative Commons: By Attribution 3.0 License. Thank you, Kevin! I’ll be posting photos of Arapaho Bend throughout this week to the In Another Minute 2016 Flickr album, on Google+ and Facebook and there will be a dedicated post on my blog.